We’d love your help. Let us know what’s wrong with this preview of The Year's Best Crime and Mystery Stories 2016 by Kristine Kathryn Rusch. 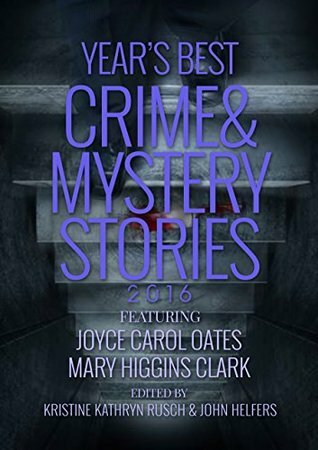 The Year's Best Crime & Mystery Stories contains the best crime and mystery stories that were originally published in 2015 in either print or electronic format as selected by editors Kristine Kathryn Rusch and John Helfers. Reading through thousands of titles and carefully narrowing their favorite reads down to the ultimate list that is presented in this volume, the The Year's Best Crime & Mystery Stories contains the best crime and mystery stories that were originally published in 2015 in either print or electronic format as selected by editors Kristine Kathryn Rusch and John Helfers. To ask other readers questions about The Year's Best Crime and Mystery Stories 2016, please sign up. As excited as I was when I found this on Amazon, especially seeing 1 author in particular who I love to read, I was very disappointed at many of the titles included. I will say there are a few short stories on their own I would definitely have given a five star rating although the actual number of stories deserving of that (in my opinion) makes this far less. In many of the stories the editing (if there was any done) is not apparent and a few even left me feeling as though I'd stumbled blindly thr As excited as I was when I found this on Amazon, especially seeing 1 author in particular who I love to read, I was very disappointed at many of the titles included. In many of the stories the editing (if there was any done) is not apparent and a few even left me feeling as though I'd stumbled blindly through the dark only to find no light at the end of the journey; there was simply no conclusion that was discernible to me at any rate. Having given it a 3 star rating, I will however remind anyone interested in purchasing and reading this that in among some not so great stories there are a few gems that did make the read worthwhile if you don't mind wading in and pushing through the rest. There are some great stories here (along with a couple of poor ones), and the individual narratives are more deserving of 4 or 5 stars. But the editing is so poor as to make things almost unreadable. It feels like an early computer reading algorithm has been given some scans and nobody has read through what it's done. Such a shame, and a great disservice to the gems you can find if you persevere. The stories were excellent, but whoever edited it should be horrified that it was released with so many typos/errors/missing words/repeated sentences/etc. Kristine Kathryn Rusch is an award-winning mystery, romance, science fiction, and fantasy writer. She has written many novels under various names, including Kristine Grayson for romance, and Kris Nelscott for mystery. Her novels have made the bestseller lists –even in London– and have been published in 14 countries and 13 different languages. Her awards range from the Ellery Queen Readers Choice Aw Kristine Kathryn Rusch is an award-winning mystery, romance, science fiction, and fantasy writer. She has written many novels under various names, including Kristine Grayson for romance, and Kris Nelscott for mystery. Her novels have made the bestseller lists –even in London– and have been published in 14 countries and 13 different languages. Her awards range from the Ellery Queen Readers Choice Award to the John W. Campbell Award. In the past year, she has been nominated for the Hugo, the Shamus, and the Anthony Award. She is the only person in the history of the science fiction field to have won a Hugo award for editing and a Hugo award for fiction. In addition, she's written a number of nonfiction articles over the years, with her latest being the book "A Freelancer's Survival Guide".